Shiny Flyyan in game: 48 Who? Important notice! Pokemon Shiny Flyyan is a fictional character of humans. 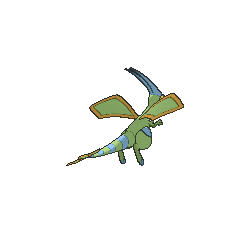 Flygon resembles a slightly insectoid, bipedal dragon. It is primarily light green and has a pair of large rhombus-shaped wings with a red trim, toeless hind legs, and skinny arms with three-clawed hands. Its tail has several dark green stripes and three small green rhombus shapes with red trims at the end. It has large eyes, and a pair of green antennae that point back. The eyes have red covers that prevent sand from getting into its eyes. With its wings, it kicks up sandstorms to hide itself. 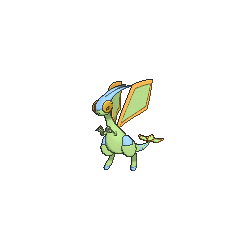 Its wings make a "singing" sound when they are flapped, earning Flygon the name "The Desert Spirit". It lives in the desert. 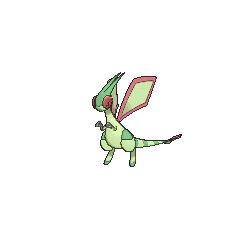 Flygon first appeared in the first Advanced Generation seriesmovie, Jirachi: Wish Maker. It helped save Jirachi from Butler. It reappeared in Destiny Deoxys. Drew owns a Flygon which first appeared in Rhapsody in Drew participating in the Battle Stage of the Hoenn Grand Festival. 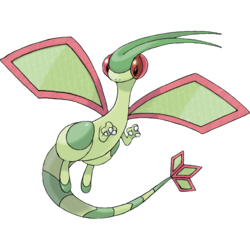 Flygon made its anime debut Delcatty Got Your Tongue, in which it was seen being used by a Trainer in a battle against Abby's Skitty, however, it was a dark black silhouette. 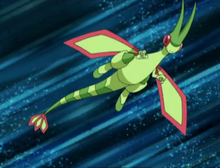 A Flygon also appeared in Giratina and the Sky Warrior. A Flygon appeared in the opening scenes of Zoroark: Master of Illusions. Multiple Flygon appeared in the book Bonnie was reading in The Clumsy Crier Quiets the Chaos!. 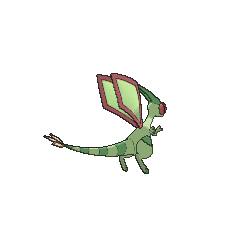 A Flygon was one of the Pokémon belonging to Norman, who mostly used it for aerial transport. 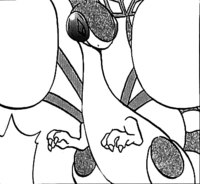 After taking Wally under his wing for the sake of awaking Rayquaza, he gave it to the boy. Flygon whips up a sandstorm by flapping its wings. The wings compose a series of notes that sound like singing. Because the "singing" is the only thing that can be heard in a sandstorm, this Pokémon is said to be the desert spirit. Flygon whips up a sandstorm by flapping its wings. The wings compose a series of notes that sound like singing. Because the “singing” is the only thing that can be heard in a sandstorm, this Pokémon is said to be the desert spirit. This Pokémon hides in the heart of sandstorms it composes and seldom appears where people can see it.